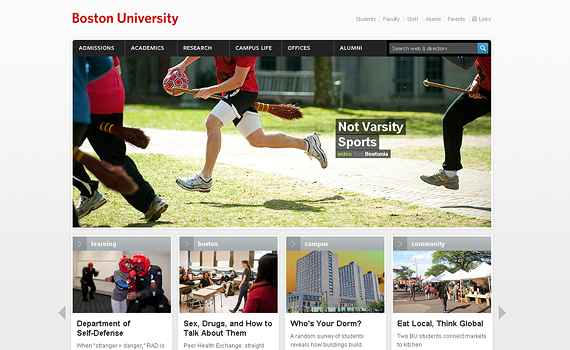 25 Awesome College Websites that will definitely WOW you! 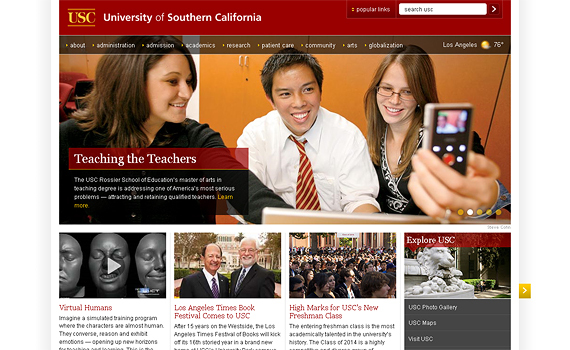 Educational institutions, particularly universities and colleges have definitely increased the quality of their web pages. In terms of design, usability and accessibility -you will notice that the designers of these sites mean business. Either to publish the latest school news, attract new students, or simply to show some school pride, the following websites will leave you in awe (or wish you can attend a class or two). This one came first for a reason. The beautiful background photography is simply stunning. 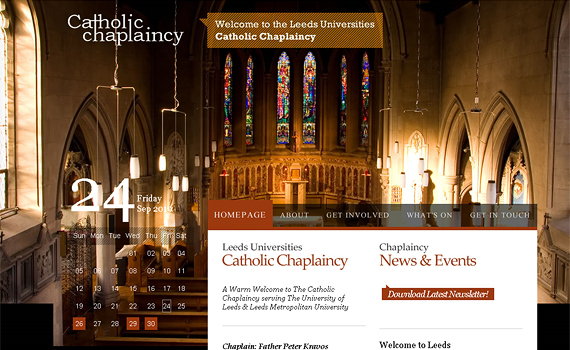 Combined with awesome typography, transparent menus, and that excellent calendar in the sidebar – Leeds University is a real treat to the eye. 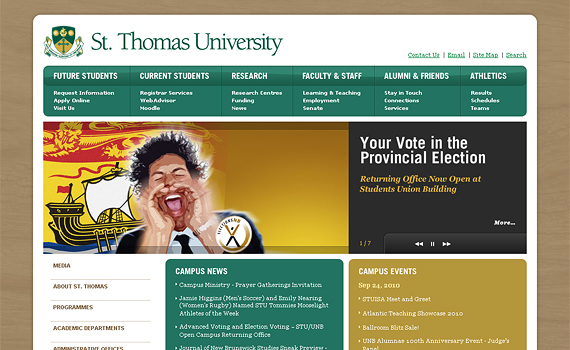 A more traditional form, St. Thomas University sports a nice wooden background, rounded corners and excellent containers within. 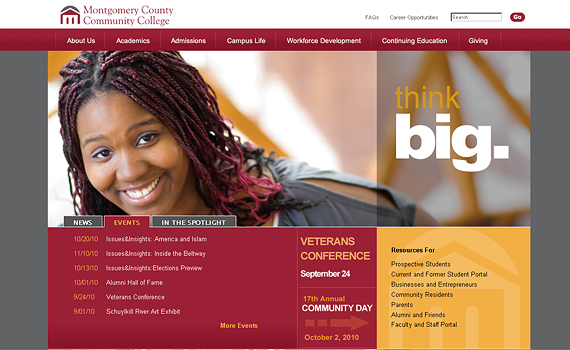 If that large slideshow in the homepage doesn’t awe you… Also make sure you notice the crafty navigation menu and beautiful inner pages of Christopher Newport’s website. Pay attention to the finer details of this website. 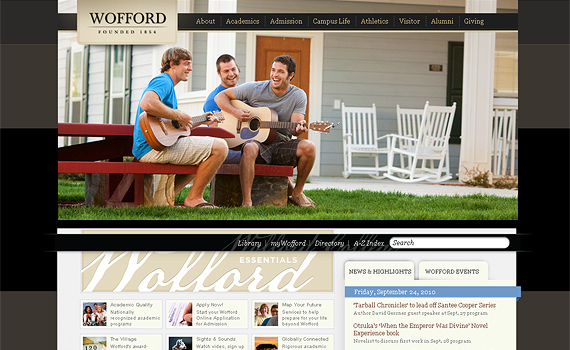 Check the headings, the logo, borders and background elements – very well done. 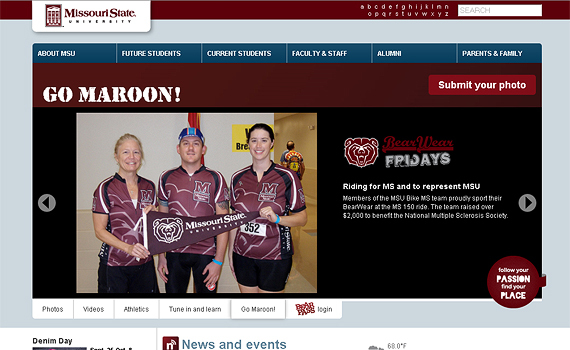 Not to focus so much on visuals, but Missouri State’s website has so much activity going on. 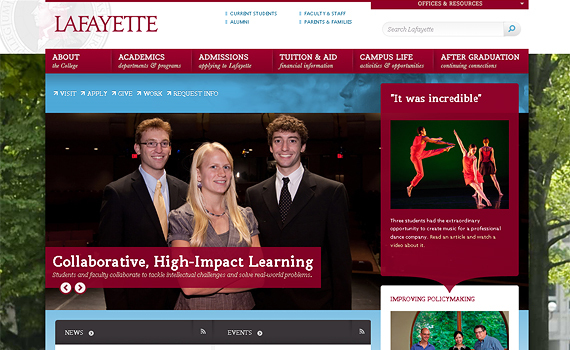 That slideshow in the homepage is dynamically updated daily with user submitted photos! 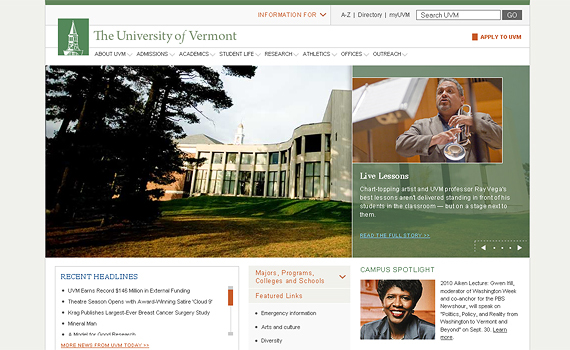 University of Vermont’s website is more traditional, yet effective design. Good sharp edges, sufficient spacing and fine typography. Ahh, Big, Bold and Brown. 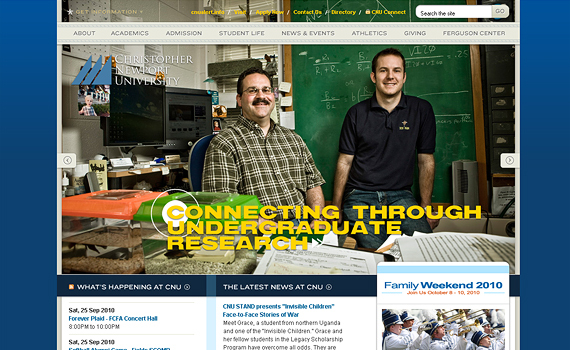 I love the feature area in the homepage especially the chosen fonts – bright yellow blends beautifully with brown. The background may be a bit overkill, but it works I guess. A large rotating image in the homepage spans snuggly across your screen. It’s quite conventional, but works really well. Good tabbed containers, color schema and of course – photography. Another favorite! That large background photo of the school grounds can be viewed with a short story once clicked. A link to the archived background photos can be seen as well (the photos are swapped weekly). The rounded containers, excellent color schema, and effective font types all contribute to this awesome work of art. 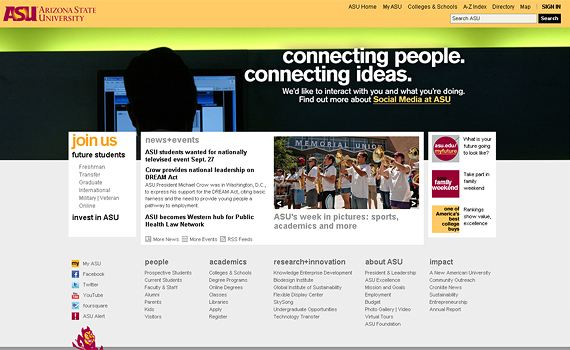 There is something about Arizona State’s website that is pleasing to the eye – but I can’t quite pinpoint. There may be some misaligned elements, line spacing issues – minor things. But overall, it is still good work. I like the blue / green combination – especially with the nature background which fades into white. 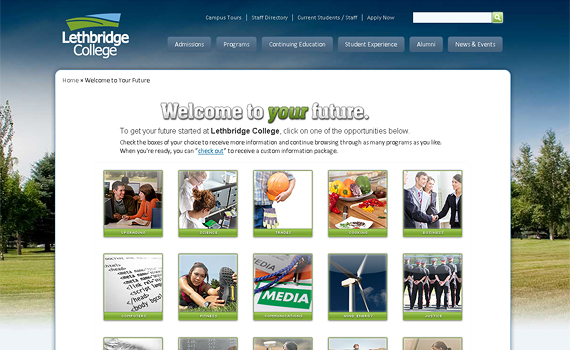 The Lethbridge College is an example of a well crafted web design. Sporting large headings, slogans and photos is always eye candy for me. 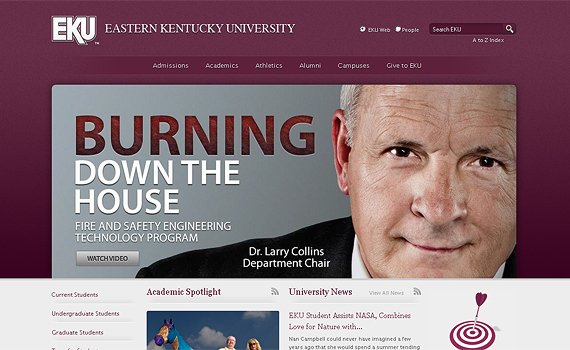 School colors are well represented, nice fades and textures – EKU has done a good job on their website. Simple and serene, sharp and clean – enough said. Color scheme is well planned, good use of fonts and soft shadows and gradients. 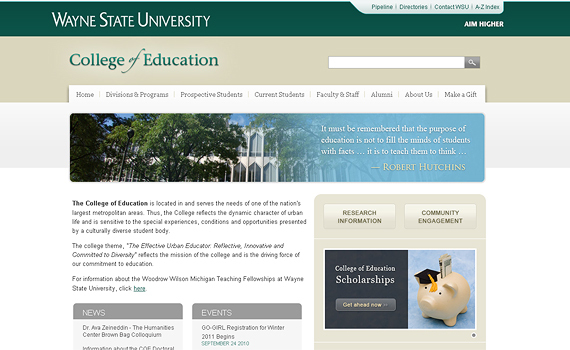 Wayne State is a thumbs-up. 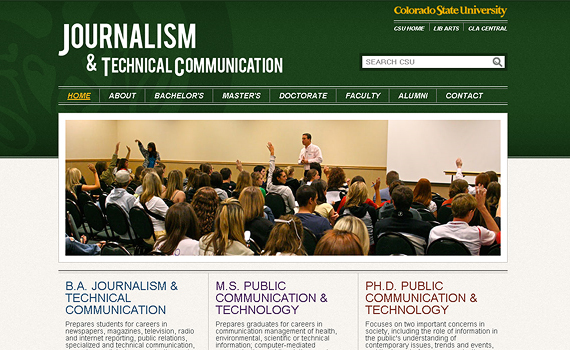 The Journalism page at Colorado State University gets the fundamentals of modern web design. Nice rotating slideshow in the center, bold headings, text treatment – the works. 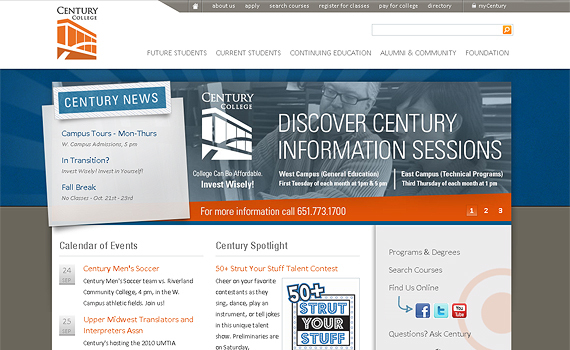 Definitely out of the ordinary, Century College’s design pops out of the crowd. Overalpping containers, shadows, beautiful fonts – very modern, sleek and unorthodoxed. I like it. 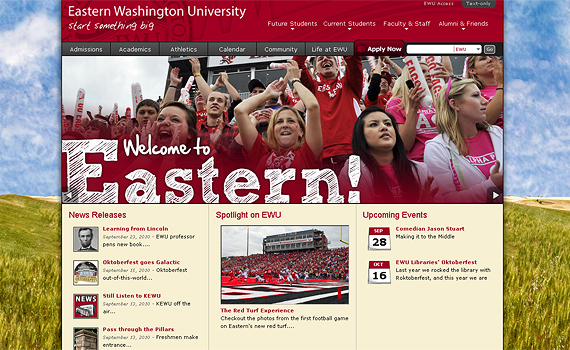 Vivid and Loud – Eastern Washington wants to be heard. Good execution of hand painted elements such as the background, welcome message, and icons. 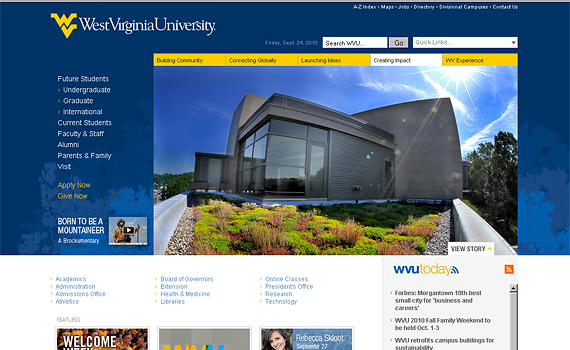 What I really liked is the footer of the pages (nice mini scrollers) – be sure to check it out. Nice representation of school colors, good thumbnails. 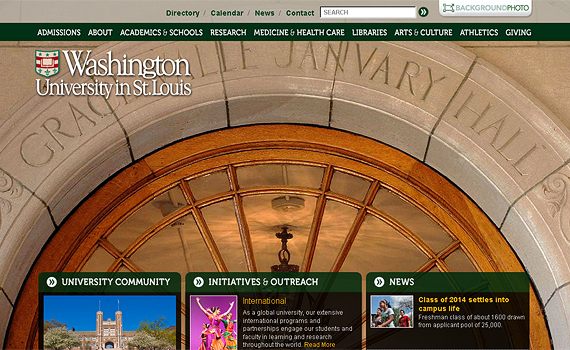 Notice the rotating image in the homepage when refreshed. Beautiful. You can’t miss the coordination of colors, the nice folded elements, extraordinary font treatment and text shadows. 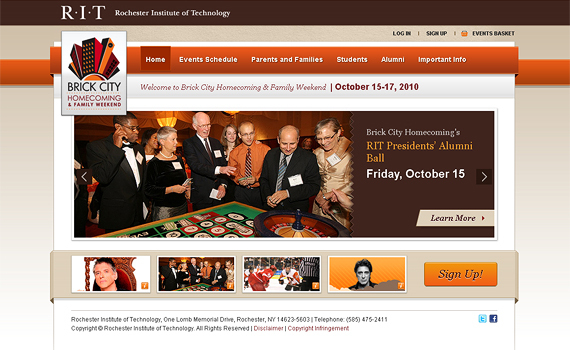 Mad props to the designer of RIT. Subtle folds in some of the containers, very sophisticated, well executed. 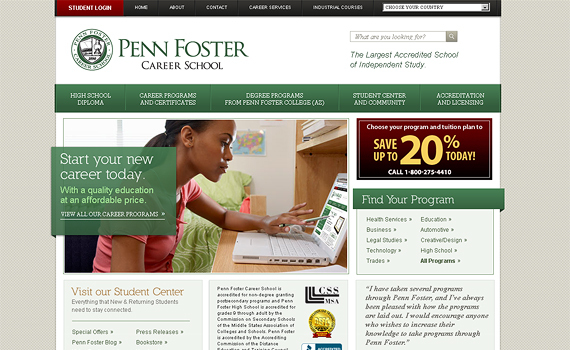 Penn Foster’s website is a symbol of prestige and high reputation. Masterfully designed. 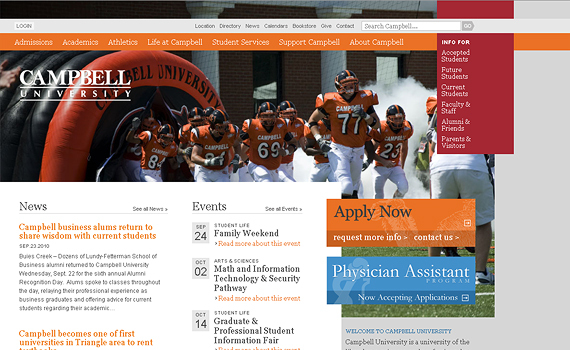 Campbell’s website is quite an eye pleaser – especially to web designers like me. It is a classic left justified page – which you don’t see often enough of, large rotating background images, excellent use of negative space as well as nice overlapping containers. I love it. Another sleek display, be sure to hover over the thumbnails in the featured flash image – notice the blurring effect in the background. Nicely done. ADD Chico State to this list! 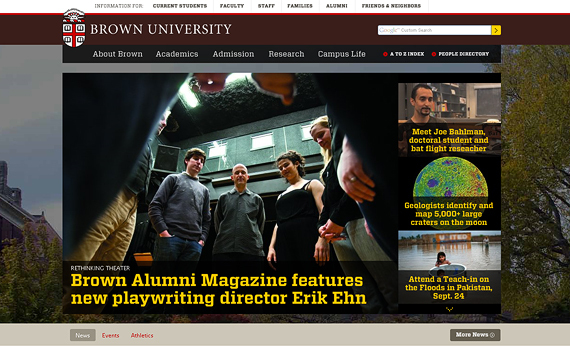 front page really sets the tone of the college! can i ask which technology used to make these sites? is wordpress sites? Maybe some of them. 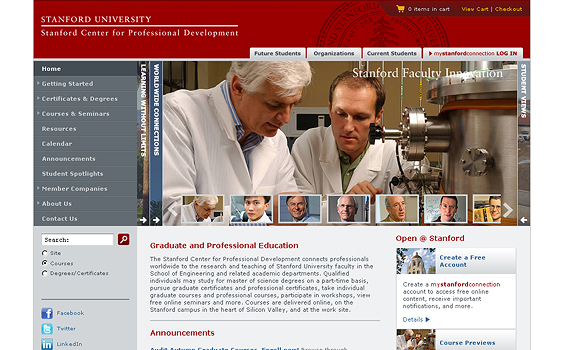 Various CMS platforms can be used to to produce these websites. 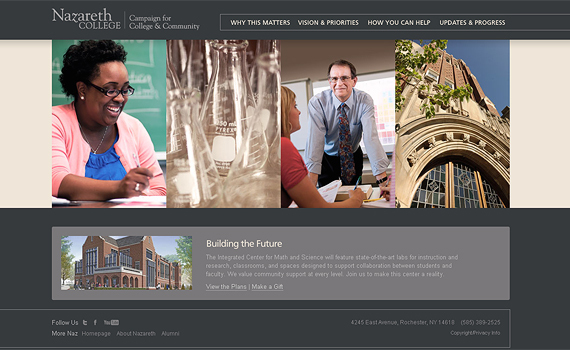 I think UVA’s site: http://www.virginia.edu/ definitely deserves a nod. Check it out and see for yourself.